Hi Téa, Welcome to Café Cala. Thank you – it’s wonderful to be here. Something smells delicious! It’s great to have you visit Café Cala. I can’t wait to read Lily’’s Leap. I love tales about Australia in colonial times. This morning I’ve been baking a cranberry and pecan loaf. Would you like tea or coffee with yours? Ah! Cranberry and pecan loaf! A flat white would be just perfect. 1 Where did you get the idea for Lily’s Leap? I volunteer there once a month. 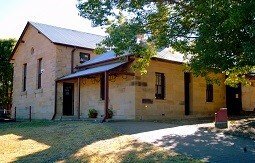 The museum is housed in the Old Court House, complete with lock-up and exercise yard. As I walk up the path my heart always starts pounding. I slip the key in the old lock and open the door …. Patrick Bruin is waiting for me! Patrick was a bushranger who got caught out and died of his injuries in the cells. And so I got to thinking about a HEA for him and Lily’s Leap is the result. I love spinning tales and putting my own twist on them. When I was a child I was often accused of “storytelling” (I think it was a polite way of being told not to embroider the facts!) Writing gives me a legitimate excuse, finally. With a crayon on my bedroom walls, according to family legend! Writing has been a big part of many of the jobs I’ve had but the opportunity to write pure fiction didn’t present itself until I was brave enough to quit full time work. A vivid imagination and countless people who have taken the time to offer advice and read my “novel attempts”. (That’s the name of the file on my computer!) And more recently a ‘who’ — my critique partner Eva Scott. I always seem to have two manuscripts going at once. I am putting the finishing touches to an Australian Historical called The Stud Master. I wanted to write a story that involved The Melbourne Cup (It’s “the (horse) race that stops a nation” for the non Aussies.) It is such an important part of Australian culture and Archer, the winner of the first two races came from NSW …. I’m also playing with a series called The Adventures of Miss Abigail Wynter. Abigail is a genealogist, working in a museum (no points for guessing where that idea came from!) and I would love to use parallel timelines but it is rather like a cryptic crossword wrapped up in a tangled ball of wool. It’s keeping me amused! I love the sound of Abigail and look forward to getting to know her better. Do it – no matter how long it takes do not put it on your bucket list. Be brave. Currently I am totally and completely besotted by Kate Morton. I am fascinated by the way she weaves parallel timelines into her stories. I’m in awe of her skill. I’m playing with the idea for Abigail Wynter. It’s difficult! Perhaps if you could send regular parcels containing this delicious pecan and cranberry slice it might make it easier …. Thanks so much for inviting me to the Café Cala. It’s been a pleasure to have you visit, Téa. What a perfect (casual) job for an historical writer, Tea! I loved Matilda’s Freedom and have LL loaded in my Kindle. I also really enjoyed Passionfruit and Poetry and was delighted to see you kept that gorgeous model when you re-released it. In recent times I have discovered time travel novels and love them so please – get writing Abigail’s story! Thanks for the pecan and cranberry slice, Maggie! Delicious! Glad you could drop by, Susanne. ooh, Abigial sounds like someone I’d like to read more about Good luck with your writing! Thanks for stopping by, Susanne, and for your lovely comments. I’m dying to get to Abigail … just sorting a Melbourne Cup story for a pitch then I’m home free. It’s burning a hole in my head – you know … wake up dreaming about it stuff!